Is Jay Ajayi's right knee troublesome or are the Eagles resting their workhorse? 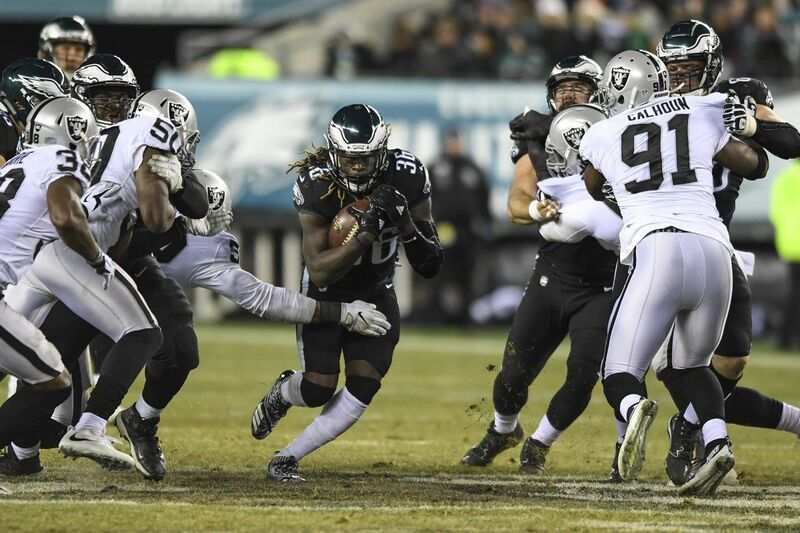 Eagles running back Jay Ajayi bursts through a hole in the Raiders defense. Is he right knee still bothering him? Jay Ajayi didn't play in the season finale against the Cowboys, even though he wasn't listed on the Eagles' injury report. There were other starters who were also given the day off without having received treatment for injury. But when the Eagles reconvened for practice on Wednesday, Ajayi was sidelined again. "As you know with his history, he's had the knee," Eagles coach Doug Pederson said when asked why Ajayi wasn't practicing. "Just rest on that knee is all." Ajayi, who returned to practice on Thursday, said there wasn't anything wrong with his knee. "I've been fine these games, been doing well. Ain't missed no practices," Ajayi said. "Obviously, [Pederson] wanted to rest me [Wednesday], but I feel good. … My knee has been fine throughout my career." Eagles running back Jay Ajayi should get a bigger workload next week. When Ajayi was in Miami, however, the Dolphins increasingly gave him a day off each week to rest and receive treatment on his right knee. The 24-year-old running back tore his anterior cruciate ligament in 2011 at Boise State, and reports that he had a chronic condition likely played a role in his plummet down draft boards three years ago. But Ajayi, who was acquired for a fourth-round pick on Oct. 31, dismissed the notion that he has lingering knee issues. "When I got here, I didn't need the rest day," Ajayi said. "I was practicing fine. This week, they told me they wanted to rest me." If the knee isn't the problem, then perhaps the Eagles are simply saving the running back for the playoffs and have plans to ride him more than they have since the trade. Quarterback Nick Foles' ineffectiveness in the last two games, and LeGarrette Blount's decreased productivity over the last month suggest that Pederson and Co. might opt to use a workhorse rather than the by-committee running-back approach they have taken all season. "I think that's a possibility with what he's shown us down the stretch here and giving him rest last week, and we'll see where he is this week health-wise," Pederson said. "I think he's one of the guys that we can rely on. "But I don't want to get away from the things that got us to this point, too. That's the other thing — you don't want to just abandon ship on everybody else." Ajayi has shown that he can handle the load. Last season with the Dolphins, he logged 17.3 carries per game, and he averaged 19.7 rushes in seven games this season before he was dealt to the Eagles. "It's not something I haven't done before," Ajayi said. In seven games with the Eagles, Ajayi averaged 10 carries and 5.8 yards per carry. In his first three games, he rushed 20 times for 194 yards (9.7 avg.). In the next four, he rushed 50 times for 214 yards (4.3 avg.). Blount, meanwhile, has seemingly worn down. He averaged 4.8 yards (137 carries for 658 yards) on 12.5 rushes a game through the first 11 games. But in his next four games, he averaged only 2.6 yards (27 for 71) and seven carries a game. Blount ran nine times for 37 yards in the finale, but mostly, it appeared, to eclipse 750 yards and trigger a $300,000 incentive in his contract. Ajayi, on the other hand, will have nearly three weeks off before the Eagles' playoff opener on Jan. 13. "If they want to run me and use me in the game plan a lot, I'll be ready for it," Ajayi said. "That's what I've been preparing myself for. Basically just getting ready for war out there. Three-game season. Leaving it all out on the line." The Eagles, of course, don't want Ajayi to empty his bucket. Unlike Blount, they have him under contract for one more year. Ajayi will be playing next season for his second deal. But with concerns about his longevity at a position at which players often wear down before they reach 30, it's unclear whether the Eagles will be in that picture. But first there is a postseason game that could be played in wintry weather. A year ago, Ajayi gained only 33 yards on 16 carries in the Dolphins' first-round loss at Pittsburgh. The game-time temperature was 17 degrees. But Ajayi, having played in Idaho, knows what's it like to play in difficult conditions. "You can see defenses sometimes get worn down because of the weather, along with running the ball hard all game long," Ajayi said. "It's definitely something we can use to our advantage." If sacks were the only way to quantify production for edge rushers, Derek Barnett's rookie season could be deemed a success. The Eagles defensive end notched five sacks in his first season, and while that is below the average for his fellow 2017 first-round colleagues, it is above the norm for edge rushers drafted among the first 32 picks. Barnett declined to assess his first year. "It's not over yet," he said Wednesday, as the Eagles prepared for next week's playoff game. But defensive coordinator Jim Schwartz seemed pleased. "When he's been on the field, he's found a way to make plays," Schwartz said. In 15 games as a backup, Barnett made 25 tackles to go along with his sacks, plus a forced fumble and two fumble recoveries. He scored a touchdown off his last recovery, which put a stamp on the Eagles' win over the Raiders two weeks ago. Among all rookies, Barnett finished tied for fifth in sacks. He was fourth among first-rounders, behind Myles Garrett and T.J. Watt (seven) and Takkarist McKinley (six). The average numbers of sacks for first-rounders usually hovers between four and five. In the last five years, the average was four. Barnett's sacks came during a midseason, seven-game stretch. He didn't have one in his final three games. He said the additional NFL games had nothing to do with the lack of sacks or a recent groin injury. "You get to the end of the season, you just got to grind through things," Barnett said. "It's longer, for sure, but at the end of the season, it's just football." Barnett may have had the fewest pass-rush snaps (316) among the Eagles' top defensive linemen – Brandon Graham (469), Fletcher Cox (422), Vinny Curry (367), Chris Long (359) and Tim Jernigan (317) – but he was right there in quarterback hurries and hits, as tabulated by the team. The order: Curry, 41; Long, 38; Cox, 36; Barnett, 32; Graham 26; and Jernigan, 18. Barnett played only 20 of 69 snaps against Oakland and was given the day off against the Cowboys. "I'm following the plan they got for me," Barnett said. He practiced all this week and is slated to play a week from Saturday. "It's tough when you're outweighed by 50 and 60 pounds and you get contact on every single play," Schwartz said of Barnett. "Those defensive linemen, it's a tough, long season, and your most important games are games that are played late in the season. He's been working through that. It's unusual for him. But it's not any different than any other rookie." Eagles receiver Shelton Gibson caught his first NFL passes last week. While Sunday was cornerback Sidney Jones' first opportunity to play this season, several other rookies were on the field for their most snaps. Wide receivers Mack Hollins and Shelton Gibson, linebacker Nathan Gerry, and defensive tackle Elijah Qualls played significantly in the meaningless finale against Dallas. Hollins has been a regular all season, but he played the most snaps (44 of 59) among the receivers and finished with three catches for 25 yards. Gibson, who was inactive for the first 10 games, played only four snaps against the Bears in Week 12 but he had 13 on Sunday and caught his first two NFL passes for 12 yards. "For me, I'm still trying to get better on special teams as a gunner," Gibson said Wednesday. "But it was good to play some on offense. I wasn't perfect. Coach always wants us to be perfect, and that's the great thing about [receivers coach Mike] Groh." Qualls was pressed into duty in previous games because of injury, but he recorded three tackles in 36 snaps against the Cowboys. Gerry, who went from practice squad to 53-man roster to weekly special teams contributor, got his first looks on defense. On his first of 20 snaps, Gerry, a college safety, had to be waved closer to the line by safety Malcolm Jenkins. "For me personally," Gerry said, "a lot of the stuff I've been putting in throughout the whole year — giving the offense a lot of looks [on scout team] and still working on my technique — it felt good just knowing that I can actually put it to work." Gerry, who finished with a tackle, nearly intercepted Dallas quarterback Dak Prescott when he undercut tight end Jason Witten. The ball hit him in the hands, but he dropped it. "It kind of surprised me a little bit," Gerry said. "And I wasn't happy about it, to be honest." Eagles kicker Jake Elliott would like to play quarterback if he did not kick. If you couldn't play the position you now play in the NFL, which position would you want to play? Quarterback. You don't get hit. When is the hardest you've ever been hit? My senior year of high school I got hit by, like, four dudes on a kickoff at the same time. What is your favorite play you ever made in football? It's got to be the Giants game [kicking the 61-yard game-winning field goal]. When did you know there was a possibility that you could play in the NFL? Probably when I was named a Lou Groza finalist my junior year of college. If you didn't play football, what career would you have? Probably some sort of marketing, or if I had stuck with tennis I might be trying to make the tour. Eagles offensive lineman Isaac Seumalo gets ready to snap the ball against the Cowboys. — At this point, it's unclear what the future holds for offensive lineman Isaac Seumalo. He opened the season as the starting left guard but was demoted by Week 3 and has since played all three primary positions along the line in garbage time. On Sunday, Seumalo took his first snaps at center. While center might be his most natural spot – he played there more than anywhere in college – he's behind Jason Kelce and Stefen Wisniewski, who are both under contract and likely to return next season. Wisniewski replaced Seumalo after his disastrous start against the Chiefs, and the Eagles offense hardly missed a beat after the switch. Asked for his position of preference or where he envisioned playing next season, Seumalo said, "I don't know." Asked for the areas in which he felt he played best when at center, Seumalo said, "I don't know." One thing that every center must know is that it's difficult to play the position if you can't verbalize basic thoughts. — The Eagles had 28 dropped passes this season, down from last year's total of 36. The log, per Pro Football Focus: Torrey Smith 7, Nelson Agholor 5, Zach Ertz 4, Alshon Jeffery 3, Jay Ajayi 2, Mack Hollins 2, Trey Burton 1, Brent Celek 1, Wendell Smallwood 1, Corey Clement 1, Darren Sproles 1. While the Eagles were better overall this season against last season, their percentage of drops per target in 2017 (5.3 – 28/525) vs. 2016 (6.6 — 36/544) didn't drop significantly. Eagles safety Rodney McLeod kept the feet of his teammates warm. "I don't care what I wore in, I'm wearing these babies home," said cornerback Jaylen Watkins, who strapped on his new pair after Thursday's practice. The numbers dropped under Eagles quarterback Nick Foles. 28.1: Percentage of third downs converted (9 of 32) with Nick Foles at quarterback following Carson Wentz's injury. Prior to Wentz's injury, the Eagles converted 44.7 percent of third downs (85 of 190). 50: Percentage of red-zone possessions converted into touchdowns (5 of 10) with Foles at quarterback following Wentz's injury. Prior to the injury, the Eagles converted 68.9 percent of possessions inside the 20-yard line (31 of 45). 3.7: Average rush of Eagles running backs (60 carries for 223 yards) with Foles at quarterback following Wentz's injury. Prior to the injury, they averaged 4.7 yards (325 carries for 1,530 yards).